Training 7 days a week. Margaret Mitchell, who runs Dundee based motorcycle training business GMTS (Tayside) Ltd is the first training business in Scotland to gain MCIAC accreditation - guaranteeing you the very highest level of training and service. 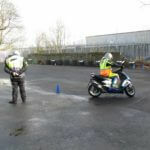 At GMTS we have 2 fully qualified DAS instructors with decades of experience between them and one down trained (Polish speaking) instructor to get you off to the best and safest start on your two-wheeled road to freedom. We will work out a programme of lessons to suit your individual requirements and deliver your training at a time and a pace which suits YOU. You can be certain that we will do our utmost to make sure that you have the best instruction we can offer, in a safe environment, and with the biggest amount of FUN we can fit in!!
" Friendly staff with easy communication to novice riders. Relaxed atmosphere between rider and instructor whilst out on the road. All good, will be back for future training." "I highly enjoyed the service. Ian is a great instructor and the company is very professional and friendly"
"Great training! I had never ridden before and I left feeling confident to take on the road. " "Absolutely loved it!!! Everyone was very helpful, professional and patient. Would recommend highly. " "Training was made fun, easy to understand and always able to ask questions if not understood. Very enjoyable"
"Amazing experience. I will definitely recommend GMTS to friends, family, etc., looking for any sort of bike lessons. Patient instructor and I’m glad I booked with GMTS." ""I found the training informative and, most importantly, safe. I am a novice rider but feel a lot more capable after my CBT. "